French Emperor Napoleon I, Napoleon admired Julius Caesar and emulated him and ancient Rome. In this picture Napoleon wears a Roman-style golden laurel wreath crown (that was worn at ceremonies by Roman rulers) and holds a scepter with a Roman eagle on it. Italian Duce Benito Mussolini standing atop a tank and making a speech to soldiers of the Italian Army. 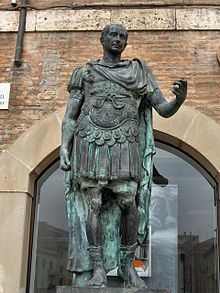 Caesarism refers to the political philosophy of Julius Caesar, and has been used in a variety of ways through history. The various uses of 'Caesarism' are documented below. It has been used by proponents of Caesarism, but it has also been used in a pejorative manner. In 1850 it was used again by Auguste Romieu but it had a different meaning. Romieu defined Caesarism as the rule of military warlords. Sociologist Peter Baehr writes "following Romieu's polemic "Caesarism"...[Caesarism] gained vogue status". In 1857 religious writer Orestes Brownson used it to mean monarchical absolutism. In 1858 the Westminster Review wrote "clumsy eulogies of Caesarism as incarnate in the dynasty of Bonaparte". Benjamin Disraeli was accused of Caesarism in March 1878 when, in anticipation of war with Russia, he mobilised British reserves and called Indian troops to Malta. G. K. Chesterton made one of the most ringing denunciations of Caesarism in his work Heretics, calling it "the worst form of slavery". Sociologist Max Weber believed that every mass democracy went in a Caesarist direction. Professor of law Gerhard Casper writes "Weber employed the term to stress, inter alia, the plebiscitary character of elections, disdain for parliament, the non-toleration of autonomous powers within the government and a failure to attract or suffer independent political minds." A so-called "democratic" form of Caesarism has been advocated by theorists like Venezuela's Laureano Vallenilla Lanz in Cesarismo Democrático (1919). The most famous person who themselves espoused Caesarism was Napoleon Bonaparte, who admired and emulated Caesar during his rule in France. Italian Duce Benito Mussolini and the ideology of Italian Fascism espoused Caesarism. ^ a b c d e f Peter Baehr. "Caesarism, Charisma and Fate: Historical Sources and Modern Resonances in the Work of Max Weber". ^ "Caesarism". The Free Dictionary. ^ "Caesarism in Democratic Politics: Reflections on Max Weber". ^ von Vacano, Diego A. (2012). The Color of Citizenship: Race, Modernity and Latin American / Hispanic Political Thought. Oxford, UK: Oxford University Press. pp. 83–111. ISBN 9780199746668. ^ Emilio Gentile, The Struggle for Modernity: Nationalism, Futurism, and Fascism. Westport, Connecticut: Greenwood Publishers, 2003. pp. 137–138. This page was last edited on 12 April 2019, at 15:59 (UTC).